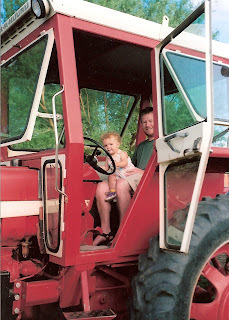 I have been wanting to write a post honoring our family farm for a long time now. Right now the surrounding land is teetering on the edge of change. So it seems like a good time to reflect and celebrate all that our farm has meant to us over the years: home, good food, family and friends, and most of all: nourishment for the soul! 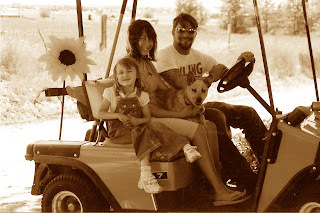 My earliest memories are of the farm, which is located just north of Brighton, Colorado. My mom and I lived there with my grandparents when I was a baby while my dad served in Vietnam. My first sentence was "see cow." 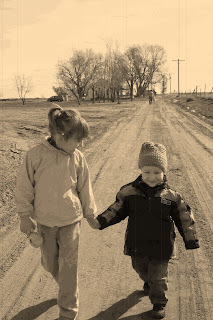 My best memories are from the farm as well, times spent with my cousins, aunts, uncles, and good friends. We all return again and again. Later on in life, right after college, I lived there with my grandpa while I was working for the Colorado Division of Wildlife. He was a great roomie, a wonderful cook, and taught me to tie flies that year. Grandpa passed away in 1999. He loved to fish the North Platte River in Wyoming. This is the place my family gathers to celebrate holidays, and just to hang out on the front porch and watch the grass grow! We've had one wedding (ours!) 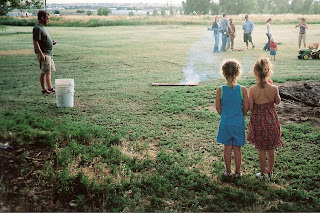 with another planned this summer (my brother's), birthday parties, memorials, shindigs, hoedowns, a Centennial party, bonfires galore, Fourth of July's, golf games, Halloween parties, company picnics, and even hosted youth church groups. Everyone is welcome. 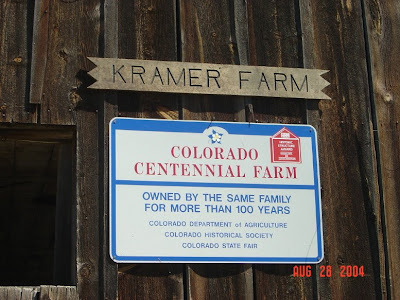 This is the Kramer Farm, part of my family for over 100 years, and honored as a Centennial Farm by the Colorado State Historical Society in 2004. The farm started out growing sugar beets, but is has also been in wheat, dairy, and sweet corn. The farm brings back memories of hard work for my mom but now she can enjoy it in her retirement, especially after being away for 23 years. The best of times, packed into the farmhouse kitchen. This is my very special Uncle Lucky pulling us on a hayride around the farm. 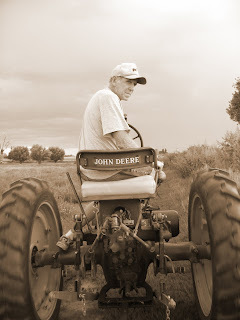 He has been part of the farm ever since I can remember. I am almost forty years old and he still calls me 'Grandbaby'! This is my Mom with grandkids and niece heading to the henhouse to collect eggs. The old homestead (most of the east wall has fallen in). 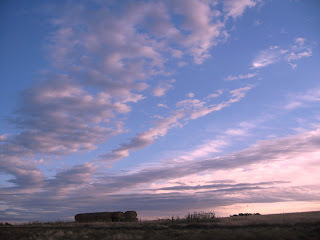 It sits up on a hill up from Mom's house and it's a great place to watch the sun set behind the Rockies. Sunrise is nice, too, when the morning light turns the flatirons near Boulder pink. In front of the old house. I have no idea why this house is still standing, I think the front porch is holding it up. Dave, Jody, Laura and Kelly dog. My grandpa would putz around in his golf cart, with an Old Milwakee's Best in the cupholder. Sometimes we'd just sit in the golf cart together and watch the sunset. 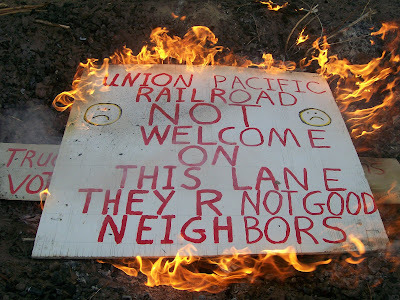 Winning the battle but not the war.... Union Pacific Railroad did not build their 'pig' yard next to the farm as planned a few years ago. However, the property was sold to Vestas Wind Systems (a Dutch wind energy company). This company is building a manufacturing plant....right next door to us: http://www.denverpost.com/rawnews/ci_11994289 Funny enough, the Crown Prince and Princess of Denmark were at the property in a ground breaking ceremony recently. And they are renaming that particular county road royal -something-or-other-lane. You can see the Vestas plant going up in the background to the left and the new fence they put up. Miss Abi - we start 'em young. My grandpa converted the cow pasture to a 'golf course' years ago, which really means closely mowed weeds. But it stays green as it's subirrigated by the ditch. It also makes a good place to light fireworks on the Fourth of July. Fifth (?!) 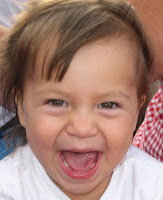 generation of "Kramer" smiles. Gathered 'round the bonfire on the 4th of July. Striking a pose next to the barn. Enjoying a hayride. This is my Aunt Sandi with one of her granddaughters. My aunt and mom worked hard to preserve our family's history through the Centennial Farm designation that it received in 1994. It was the 299th Centennial Farm in Colorado. Ben contemplating life from the hayloft. The view from "Holding Hands Bridge." Lucky built it and the rule is that you have to hold hands when you cross it. The farmhouse (with tire swing) that my grandpa built. There is no better place to be than in the shady yard on a hot summer day. Orioles nest in the trees and finches in the top of the propane tank. Someday we should rebuild the treehouse in this cottonwood by the ditch. The place to be for cookies and milk - or to gab over a cup of coffee. back to Peru to live. Happily they are now in the U.S. to stay! We could sell this property and be millionaires but so what? We would lose our sense of family and community. We'd be displaced in life. The land is not what is most important. The land is a tool to keep the family together.